Bobbi Brown Holiday 2013 Collections Preview! We reached on the dot and many people were there already! Opening speech from Bobbi Brown's General Manager (hope I didn't remember wrongly). Look at the crowd above! Next, Bobbi Brown Trainer, Sophion Loh was invited up onto the stage. he introduced their facial features and what sort of makeup suited them. Can you believe the above models are all 40+ years old?! Bobbi Brown products suited them all so well and they all look young. Next, it was a make up demo by Sophion Loh himself. Bobbi Brown isn't only suited for 40 and up. It's suited for all ages! The model her is in her early 20s! That was the end of the showcase and it was time for us to take a look at the products! Hollywood Glam, Bobbi Brown Holiday 2013 Collection! The hot red lip gloss looks super pretty! On another counter they showed some of the gift sets that Bobbi Brown has. The packagings are mad pretty. Anyone wants to get me one some for Christmas? #greedygirl hahas. they can be used for more than 10years! 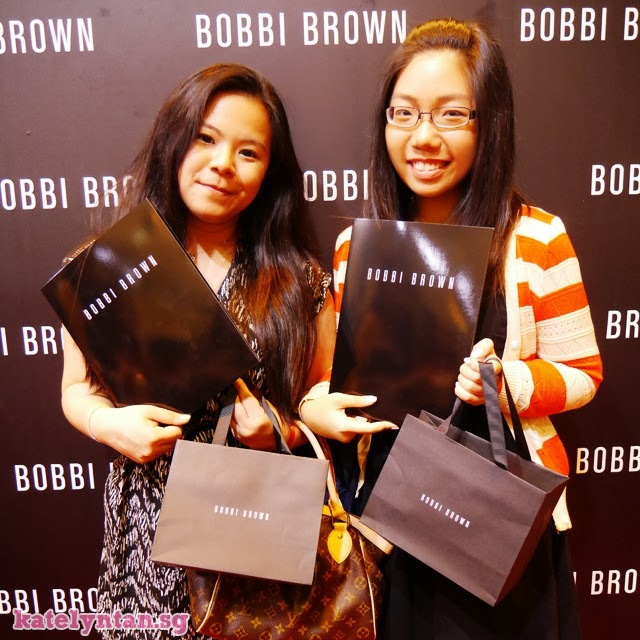 Next we collected our goodie bags from Bobbi Brown. Photo with the goodie bag and media kit on the red carpet. Yes there was a red carpet and professional photographers there! And now... for the stuffs in the goodie bag. I was so excited to find out what was in the bag! The Bobbi Brown team packed it super nicely! Look at how generous the Bobbi Brown team was! And there's their signature gel eyeliner inside too! Can't wait to try all of them. Will be reviewing them in another post. Feel free to comment what are your favorite products from Bobbi Brown! This looks like so much fun! I love all the red dresses and that long sleeved gold top! It looks like you got some great products to try out. I'm looking forward to reading your reviews! great event and you even have a goodie bag!! hope you do a review on the stuff you got!take care! Looks like a great event. :) Love the photos! oh my god! you have them already! i just posted about the bobbi brown christmas collection on my blog too, but they're not to be available just yet! so jealous! you got quite a hefty! wow the palette look pretty! What great pictures! What a fun event, thanks for sharing. I adore Bobbie brown! Wow!!! you got the bobbi brown new collection! Lucky you girl! I've been meaning to try bobbi brown ever since! Greetings! It's good to see another Singaporean Blogger. Lovely blog you got here. OMG! You're so lucky! I want to try Bobbi Brown soon! wow it looks sooo great! Love the set! I must try this soon! Wow so cool!! I wish I can go.. I should go and check out the collection soon! Can;t wait to read your reviews soon!